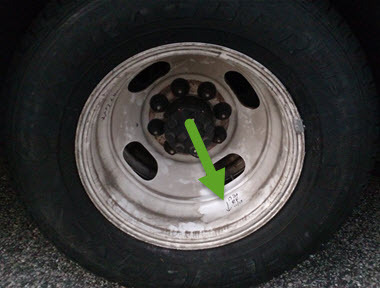 If your motorhome has a wheel or tire vibration from 50 - 75 mph, this is the proper way to fix it. I spent a lot of time reading all the myths and beliefs online, and none of them worked. I have spent a lot of time to determine the cause, and have documented the way to fix it. 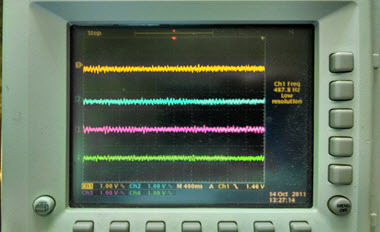 Sensors - I built four "G"(Vibration) Force sensors using an IC that can measure force in all three directions, but I only used the "Y"(Up & Down) output. 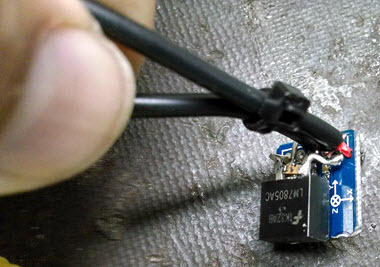 I attached power and signal connectors to the IC, then encapsulated the IC and voltage regulator in epoxy with a right angle metal bracket sticking out of the epoxy to mount the sensor. I then mounted a sensor on each front A-arm near the spindle using a hose clamp making sure to place the "Y" Axis in a vertical orientation. 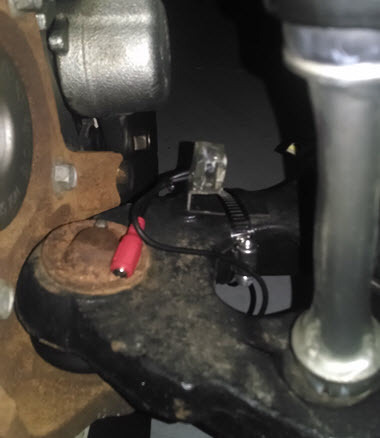 I mounted a sensor on each end of the rear axle near the leaf spring bracket using hose clamps, and again making sure the "Y" axis was in a vertical orientation. 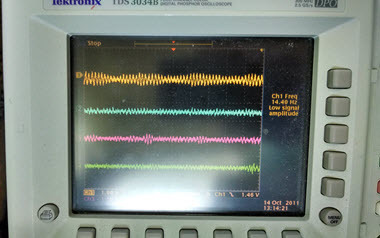 I ran cables back from each sensor to inside the drivers door and connected them to a four channel oscilloscope. 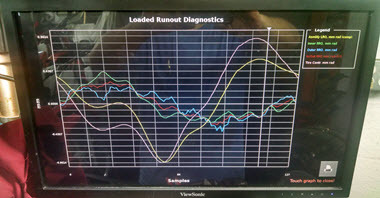 The four channel oscilloscope allows me to see the vibration force at each wheel. The top yellow signal on the oscilloscope is the front right wheel sensor. 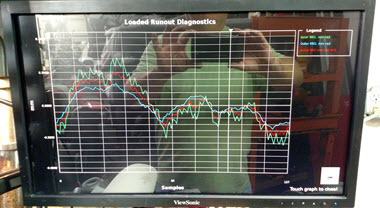 I drove the motorhome up to 72mph, where my vibration was, and captured the screen on the oscilloscope. You can see the out of balance harmonics(vibration) indicated by the Red arrows. 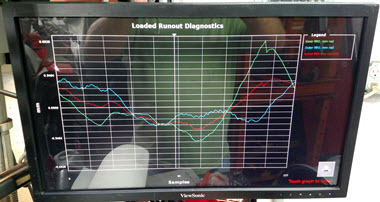 This is the harmonic resonance of the tire/suspension/and vehicle frame. This tire and wheel combination was just road forced balanced on the latest Road Force Touch Balancer, and had less than 7 lbs of Road Force. That is about as good as you can match a tire to a wheel. Hunter, the manufacture of the Road Force Touch says anything below 14 lbs of Road Force is acceptable and can't be felt. The question now is why is it out of balance and vibrating? So, I get out the dial indicator and measure the rim for being out of round on the motorhome. It is less than 0.015" out of round. That's almost perfect for a steel wheel. The tire however has a pretty significant hop to it. NOTE: THERE IS NO SUCH THING AS A ROUND/TRUE STEEL WHEEL, OR A PERFECTLY ROUND TIRE! Using the Hunter Road Force balancer, you can match the high and low locations of a tire and wheel combination to make an almost perfectly round combination. I actually prefer an out of round steel wheel over an aluminum wheel. It balances much better on a Road Force balancer. The combination of the wheel and tire was almost perfectly round on the Hunter Road Force Touch, only 7 lbs out of round, but significantly out of round when mounted on the motorhome? I removed the wheel and tire, checked the spindle hub face with the dial indicator, and it was less than 0.005" out of plane. I then checked the hub centric shoulder on the hub, and it was less than 0.004" off center. So, what could it be? 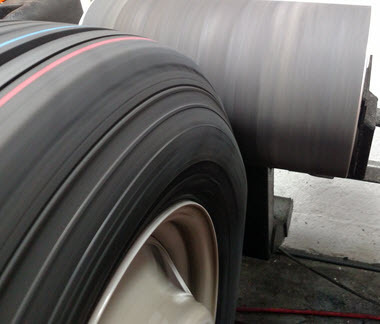 Why do so many people have vibration problems with these motorhome wheels? It's all over the internet and a constant source of discussion when you talk to other motorhome owners. It is the offset Dually wheel. When mounted with the centering spacer and cone, the inside rim lip has one shape. When mounted on the hub of the motorhome, it has a completely different shape. 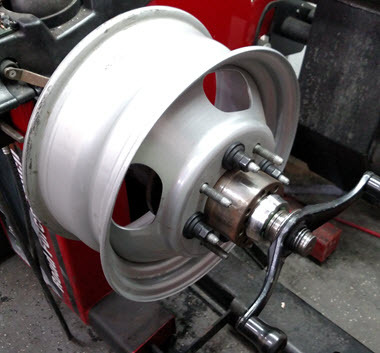 The wheels warp when not mounted to the hub flange of the motorhome. So, I ordered a replacement rear axle hub for my motorhome, making sure to get the correct hub centric diameter for my wheels. There are a variety of hub centric holes for both Chevy and Ford. They are available from everyone, including Amazon for about $80. I found the correct centering spacers to mount the hub on the Road Force Touch. I removed the hub from the Road Force Touch, and installed it on the wheel removed from the motorhome using four of the lug nuts. Installed the tire & wheel & hub mounted on it, on the Road Force Touch. The same wheel & tire combination that showed only 7 lbs of road force when mounted with just the centering spacer & cone, now showed 32 lbs of road force. 32 lbs of road force is enough to cause a slight vibration. Hunter says anything below 44 lbs on a truck tire can't be felt. I couldn't believe it, so I removed the spindle hub, put it back on the road force, and it was back to 7 lbs of road force. 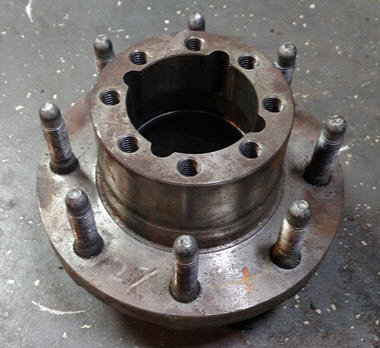 So, I mounted the spindle hub back in the wheel with all 8 lug nuts. I put it back on the road force and now it had 77 lbs of road force. 77 lbs is enough to cause my vibration for sure. I removed the spindle hub again, mounted it on the road force and was back to 7 lbs of road force. I put the spindle hub back in the wheel & tire with all 8 lug nuts, mounted it on the road force, 77 lbs of road force. 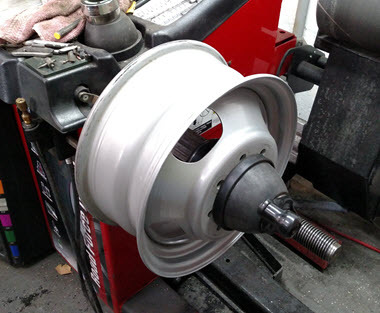 I road force balanced the wheel & tire mounted on the spindle hub. I had to turn the tire about 130 degrees on the wheel and ended up with 5 lbs of road force and a 1 oz and a 0.5 oz weight. Removed the spindle hub and installed it on the motorhome. No more vibration!!!! 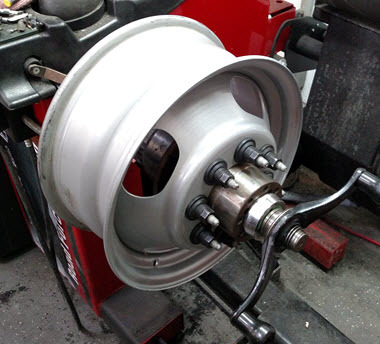 I repeated the spindle hub procedure on the remaining five wheels. The other wheels where around 22-27 lbs of road force. I was able to get them all below 20 lbs. What a joy it is to drive. A drink in the cup holder doesn't even have ripples on it while driving. Look at the three mounting examples below. You can clearly see how the rim changes shape by the way it is mounted. You can clearly see that there is a major change in shape from 4 lug nuts to 8 lug nuts. YOU MUST USE A SPINDLE HUB AND 8 LUG NUTS TO PROPERLY BALANCE THESE OFFSET STEEL WHEELS!!! There is no other way to properly balance offset dually wheels. The Flange plate accessory can't put enough pressure on the wheel to simulate being mounted on the spindle. 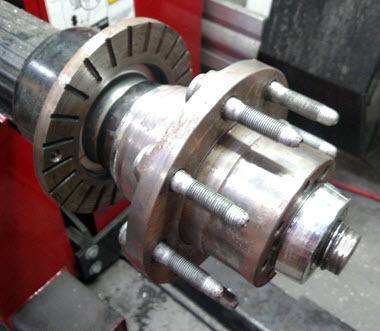 You have to use a spindle hub. #1 Before road force balancing any tires, drive the motorhome and warm up the tires. After the tires are warmed up, be sure to jack up the motorhome within five minutes of stopping so the tires don't get a flat spot on them. 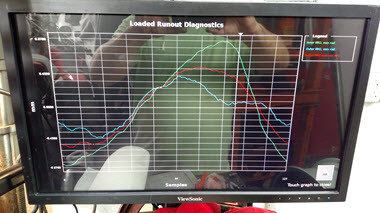 #2 When installing new truck tires, I always run them on the road force balancer twice at 25psi. This helps to remove the two flat spots on them from sitting on the rack. I always store new tires on their side, not standing up. 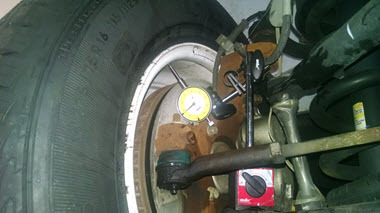 The road force machine will try and use the flat spot to balance the tire. #3 Mark the road force weight amount and location on the rim. When mounting the rear dullies, match the weights of the inner and outer tires as close as you can, and mount the inner and outer road force weight locations 180 degrees from one another. 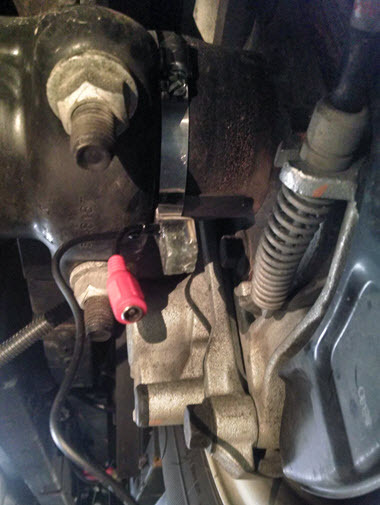 The valve stem location doesn't matter. Putting the road force weight locations 180 degrees from one another doubles the frequency. Doubling the frequency will stop the harmonic vibration at a specific speed. Final Thought - This took years to figure out. 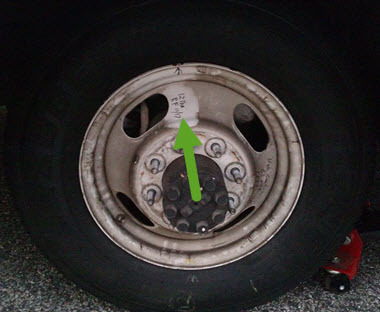 I used to true all my tires mounted on the motorhome to get rid of vibration because I couldn't figure out what was different when they were mounted on the motorhome. Now I know. I can balance them and mount them on the motorhome with no vibration. 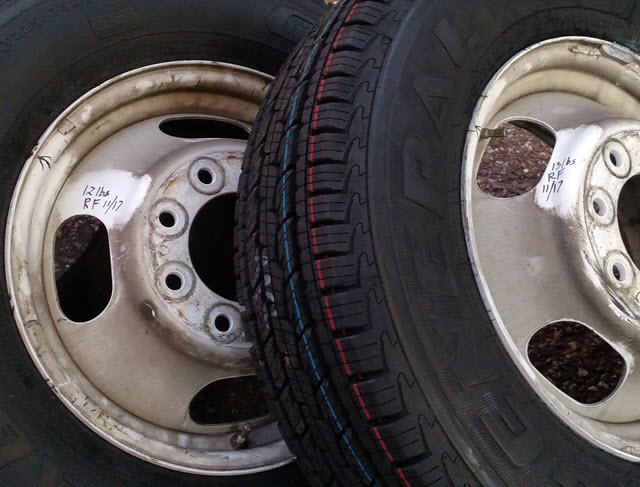 In my 200K plus miles of driving a motorhome, I've tried all the tires out there. Goodyear, Michelin, Continental, General. In my opinion, the General Grabber HTS drive the best. They have the best steering response, and wear very even.